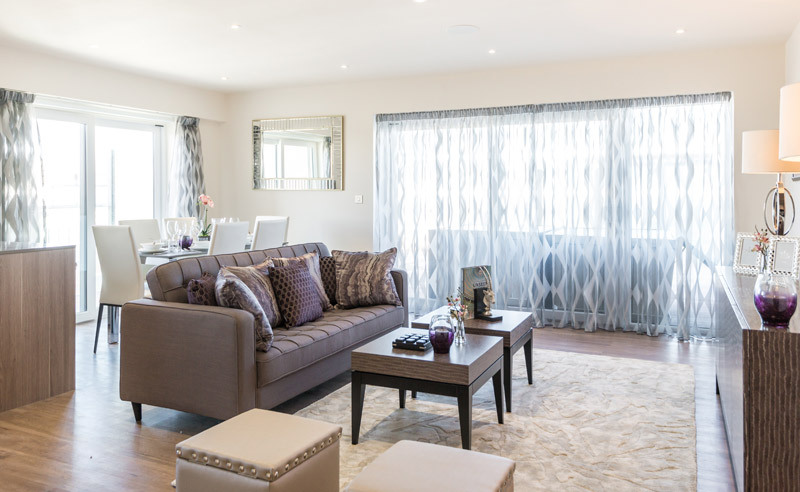 The ani M INTERIORS team loves a challenge, so when a family of six needed a holiday apartment designed to meet their needs while still feeling spacious and relaxing, the team relished the task. 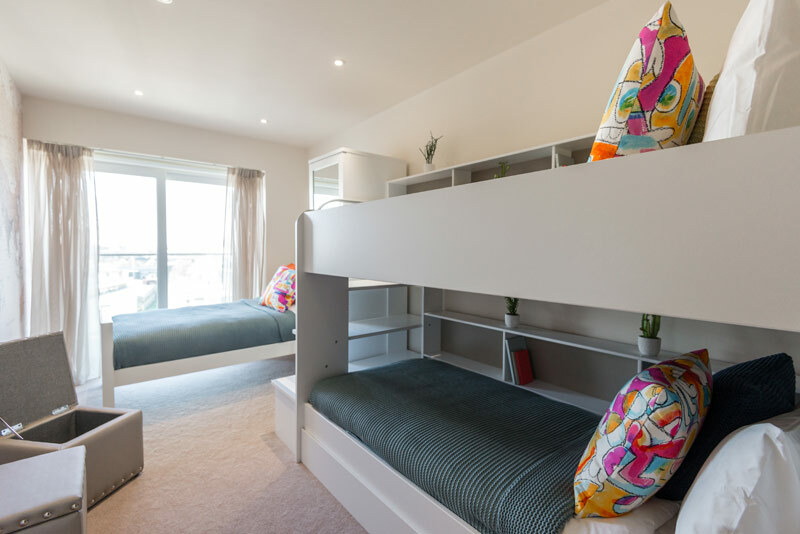 This beautiful two-bedroom, two-bathroom apartment in the Beaufort Park development in North West London serves as a holiday home for a family with four young children when they visit London. The client needed help to maximise the space to accommodate the family but was unable to oversee the transition due to being based abroad. 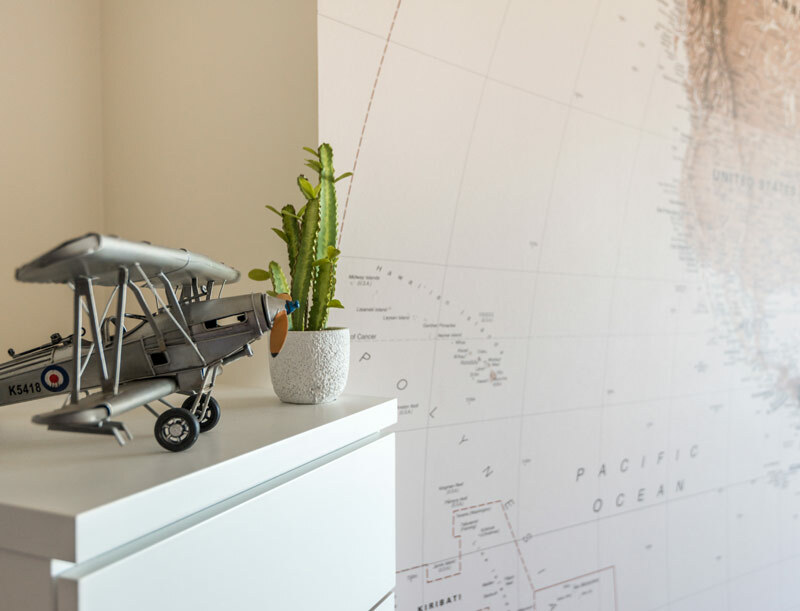 The Beaufort Park developers were happy to recommend the ani M team as professional interior designers who could not only do great things with limited space but could also add style and personality to help the property feel like a home from home. Overseen by senior interior designer Severina Oborotova, the space was considered strategically to help six people feel comfortable. The biggest challenge was choosing the right furniture and layout for the second bedroom which had to sleep four children. Severina chose one sleek modern bunk bed, with steps at the rear, and a large single bed that could fit two. With so many beds, the room could easily look cluttered, so she picked out simple white furniture to keep the space looking bright and clean. Then to give the room personality, Severina chose amazing wallpaper that shows a map of the world. The client was delighted as it educates and entertains the children while reflecting the family’s love of travel. In the master bedroom, the team focused on creating an environment that the clients could relax in away from the bustle of family life. Wood, mirror and natural tones of grey and fawn lend an air of refined elegance. 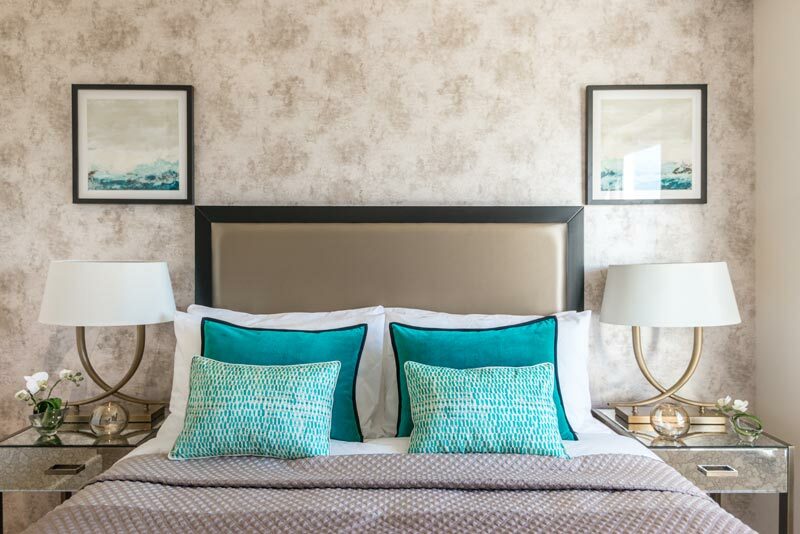 The symmetry of the lamps and bedside tables make a focal point of the large bed, while woven throws and Tiffany blue cushions make the bed itself sumptuous and inviting. For the reception room, care and consideration again had to be given to the space. Simple, clean lines would make the room appear bigger, but it still had to be comfortable and welcoming for six people. Severina and the team suggested an L-shaped sofa to provide flexible seating without taking up the space of a conventional three-piece suite. The sofa had the additional feature of opening to a double bed to provide more sleeping options should the family need it. Finally, warm plum tones were chosen for the soft furnishings accented by rich dark wood so the whole room felt warm and inviting. There was consultation at each stage of the project with samples of wallpaper, fabric and colour swatches sent to the family’s permanent home overseas. It meant that the team was able to progress confidently knowing the client’s tastes and the client felt that their location wasn’t a barrier to their involvement in the transformation. The project ran smoothly and the family is delighted with both the look and the quality of their new holiday home. If you would like the team to rethink your home or even holiday home to make best use of space then get in touch with the team who will be happy to help.